to the glory of your holy name; through Jesus Christ our Lord. Amen. Anything that draws us away from God is, for us, idolatrous. An idol need not necessarily be a false god, such as Baal Peor. It can be, of course. Perhaps one’s idols are wealth and social status, as in 1 Timothy 6 and Luke 16. If not, one still has at least one idol, to be sure. Idolatry can be a difficult matter to address properly, for one must first identify one’s idol(s). Each of us has spiritual blind spots, so each of us needs others to tell us what is in them. Furthermore, that which is an idol for one person might not be one for another; the test is function. For some even the Bible becomes an idol, for it takes the place of God for them, becoming the end, not a means toward that end. Committing bibliolatry is a frequent sin, alas. With the help of God may we recognize our idolatry, confess it, and repent of it. Then, by the same power, may we refrain from committing that sin again. The Law of God is holy; both the Psalmist and St. Paul the Apostle agree to that proposition in two of the assigned readings for today. Yet St. Paul admits that he also finds the definition of sin that the Law proves to be a temptation to sin. This passage precedes the famous portion of scripture in which the Apostle confesses that he knows the difference between right and wrong yet often commits the latter, even though he wants to do the former. He is divided within himself. In 1 Kings 12 the foolishness of the newly crowned King Rehoboam leads to the division of the Kingdom of Israel. He ends up as the King of Judah instead. So begins the decline of the realm King Saul once led. We know via hindsight that both kingdoms will fall and ten tribes will become lost. We also read of division in John 7. Is Jesus the Messiah? Or is he a blasphemer? His life is certainly at risk. is a group of unlike-minded people who live out their faith and practice discipleship together. Yet frequently one reads and/or hears of and encounters denominations and congregations formed or divided by the quest for like-mindedness and founded by the act of schism. Even those who seek to reject denominationalism create new denominations, although many members of officially “undenominational” bodies object to that statement. Part of the problem of divisiveness is that it is inherently human. We like to keep company with people similar to ourselves. Although the variety of denominations certainly keeps many people in the Christian fold by providing options, the scandal of denominations is that they divide the body of Christ. I belong to a denomination–a fairly liberal one, in fact. I like attending church where nobody will call me a heretic, for I know the sting of hearing that accusation. Nevertheless, I also understand denominational inertia and am willing to surrender certain minor points of doctrine and practice for the sake of organic unity with a denomination or denominations with which mine is quite similar. When organic union is not yet an option or never will be, perhaps ecumenism is on the table. But how common are these attitudes? Easter is a season that lasts for fifty days, from Easter Sunday to Pentecost. The Sixth Sunday of Easter falls late in the season, with just two weeks left until Pentecost. Late in the season of Easter the theme of new life from death continues. God provides for the physical needs of the unpopular prophet Elijah during a drought. Later in 1 Kings God acts through Elijah to restore a widow’s son to life from physical death (17:17-24). The author of Psalm 134 affirms the value of blessing and praising God. The text is a priestly benediction. And why not bless and praise God, upon whom we depend totally, who has given us life and upon whom we depend for the sustenance of life? God acts through Jesus to restore a young man near death to health in John 4. Notably Jesus dos this from a distance, thereby proving that he does not need to be in the proximity of the ailing person. God rescues the faithful from cosmic death in Revelation 20, after the final divine victory over evil and prior to th descent of the New Jerusalem in Chapter 21. Life is precious. We ought to enjoy it while using our time (however much God grants us) to glorify God and help each other as much as our talents, abilities, and circumstances permit. May we help each other do this as we are able to do so. And may others do the same for us as they are able, all for the glory of God and the benefit of others. O God, our true life, to serve you is freedom, and to know you is unending joy. We worship you, we glorify you, we give thanks to you for your great glory. 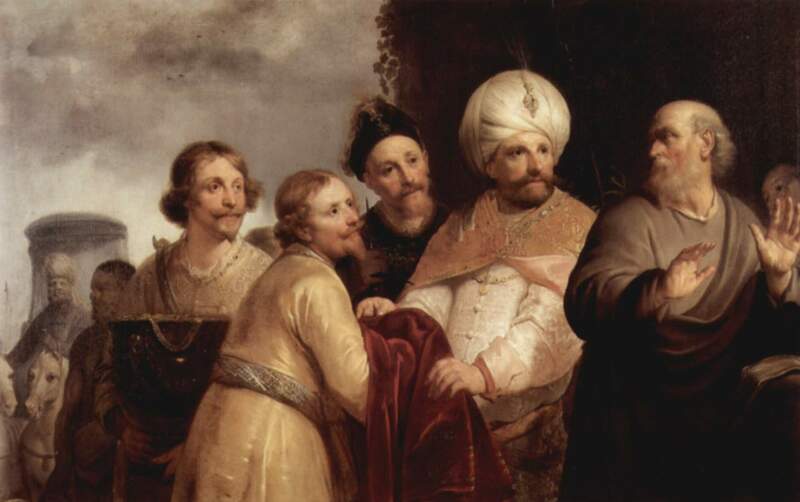 The reading from Second Zechariah is an allegory of a selfish and foolish shepherd who, instead of protecting the sheep of his flock, sells them to their slaughterer for the sum of thirty shekels of silver. The identification of the shepherd (code for political leader) is open-ended, and the price for which he sells the sheep of his flock to their doom is the same amount Judas Iscariot went on to receive for betraying Jesus in Matthew 26:14-16. One might surmise correctly that many members of Matthew’s audience, being Jews familiar with their scriptural heritage, would have recognized the echo of Zechariah 11. Perhaps Second Zechariah was thinking of monarchs such as Jehoiakim (reigned 608-598 B.C.E. ), of whom one can read in Jeremiah 22:13-19, 2 Kings 23:36-24:7, and 2 Chronicles 36:5-8, and of his son, Jeconiah/Jehoiachin (reigned 597 B.C.E. ), of whom one can read in Jeremiah 22:20-30, 2 Kings 24:8-17, and 2 Chronicles 36:9-10. Jehoiachin was the penultimate King of Judah, and, by the time of his deposition by a foreign potentate, the realm Kingdom of Judah was obviously independent in name only. and gives him no wages. and paints it with vermillion. Such shepherds abound, unfortunately. I refer not to those who strive to do the right thing for their populations yet fail to accomplish their goals, but to those to operate not out of any sense of seeking the common good but out of greed, self-aggrandisement, and indifference toward justice, especially that of the economic variety. Among the most familiar images of Jesus in the Gospels is that of the Good Shepherd (John 10:1-21), who not only watches his flock attentively but lays down his life for it. The Good Shepherd is the polar opposite of the shepherd in Zechariah 11. The Good Shepherd is Jesus in 1 Peter 1 and the figure who points to powerless children as spiritual models in Luke 18. The Good Shepherd is one consistent with the description of God in Psalm 46. To be a sheep in the flock of the Good Shepherd is wonderful indeed. For this, wrath is upon you from the LORD. However, there is good in you, for you have purged the land of the sacred posts and have dedicated yourself to worship God. One can read of the reign of Jehoshaphat in 1 Kings 22:1-51 and 2 Chronicles 17:1-20:37. Hebrews 9:23-28 concerns itself with the atoning qualities of the crucifixion of Jesus. I, as a student of Christian history, in particular of the development of doctrine and theology, know of three early theories of the Atonement. Two of these include the death of Christ. Penal Substitutionary Atonement does not satisfy me (forgive the double entendre), for it depicts a deity in which to stand in dread, not awe. that deity proclaims. The Classic Theory, or Christus Victor, however, places correct emphasis on the resurrection. Without the resurrection we have dead Jesus, who cannot save anyone. Both Ahab and Jesus died. Ahab, who died foolishly (despite warning) and was idolatrous and evil (consult 1 Kings 16:29-22:40 and 2 Chronicles 18:1-34) had it coming. Jesus, however, was innocent of any offense before God. The death of Ahab brought to the throne of Israel his son, Ahaziah, who followed in his father’s ignominious footsteps (consult 1 Kings 22:52-54; 2 Kings 1:1-18). The death of Jesus, in contrast, played a role in the salvation of the human race from sin. May we who follow Jesus respond to him, treating him as our savior, not merely another martyr to admire. Grace is free yet not cheap; ask Jesus. It demands much of us, such as that we not be as Kings Ahab and Ahaziah were. our Lord Jesus Christ, the shepherd of the sheep. The difference in translation is mostly in the second half of that passage. The issue in Psalms 14 and 53 is practical atheism, not the denial of the existence of God. Belief in God, in the Biblical sense, is trust in God, not mere affirmation of divine existence. Thus the benighted man/impious fool operates under the mistaken idea that God does not care. Actually, God cares deeply, especially about how we mortals treat each other. My princes shall no more defraud My people, but shall leave the rest of the land to the several tribes of the House of Israel. Thus says the Lord GOD: Enough, princes of Israel! Make an end of lawlessness and rapine, and do what is right and just! Put an end to your evictions of My people–declares the Lord GOD. References to such evictions occur in 1 Kings 21:1-16; Isaiah 5:8; and Micah 2:2. The timeless message here is that nobody has any right to improve his or her financial position by victimizing others, especially the powerless and the less powerful. Climbing the ladder of success by kicking others off it is immoral. St. Simon Peter’s healing of Aeneas, a man bedridden with paralysis for eight years, built up Aeneas, restoring him to health and community. Whatever we do to each other is what we do to ourselves. If we keep others”in their place,” seemingly to improve our circumstances, we really hurt ourselves, for we doom ourselves to monitor others instead of pursuing proper opportunities. May we build each other up in the name of Jesus Christ, enabling each other to become the people we can become in God, for the glory of God and the benefit of the whole. To use a cliché, we are all in the same boat. One can perceive divine wisdom only via God. Such wisdom, which is for the building up of community (faith and otherwise) and not of self at the expense of others, is frequently counter-cultural. We who claim to follow God should be careful to avoid the opposite fallacies of complete accommodation to social norms and of serial contrarian tendencies. Letting go of proper standards is at least as bad as distrusting everything “worldly,” much of which is positive or morally neutral. The narrative pericopes from the Hebrew Bible for these days tell of God extending mercy to people via people. In one account the conduit is the prophet Elijah, who helps an impoverished widow of Zarephath. In the other story a captive Hebrew servant girl suggests that her Aramean master, Naaman, a military commander, visit the prophet Elisha for a cure for his skin disease. Naaman is surprised to learn that the remedy is to bathe in the humble River Jordan seven times. Divine help comes in unexpected forms sometimes. Having a receptive frame of mind–perhaps via divine wisdom–is crucial to recognizing God’s frequently surprising methods. I have never had a miraculously refilling jar of flour or jug of oil, but I have known the considerably mundane and extravagant mercies of God in circumstances ranging from the happy to the traumatic. Either God’s mercies have been greater in proportion to my sometimes difficult circumstances or my perception was proportionately greater and divine mercies have been equally extravagant across time. Was the light bulb brighter or did I notice it more because the light outdoors became dimmer? I do not know, and perhaps the answer to that question does not matter. Recognizing divine mercy and wisdom then acting accordingly does matter, however.